KUALA LUMPUR: While most of the time Prime Minister Datuk Seri Najib Tun Razak is seen as an authoritative figure, impeccably dressed and always speaks in business-like tone, the number one man in Malaysia showed his other side at the Wild Digital Conference 2016 here today. 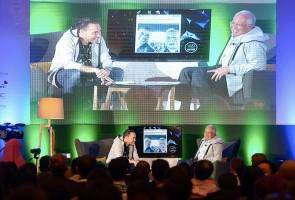 The two-day event, touted as Southeast Asia's premier digital conference featured Najib as a guest for its Fireside Chat hosted by Catcha Group Co-Founder and Group Chief Executive Office Patrick Grove. The event started brightly as Grove coerced Najib into wearing a hoodie specially designed for him to which the Prime Minister happily obliged. The conversation then turned to Najib's music taste and favourite artistes as well as his social media presence. In fact, during the conversation, Najib also confirmed owning a dugout seat sat on by Sir Alex Ferguson, Manchester United's legendary manager. "However, I will not reveal where it is kept," added Najib with a chuckle. Grove also asked Najib how he deals with the day-to-day business of being the number one leader of the country. The conversation then turned sombre as Najib related his experience dealing with the tragedy of Malaysia Airlines MH17 flight. "It is tough dealing with these families who lost their loved ones. However, I kept asking myself what I could do to help them in any way? "Maybe by giving them some closure, it would help with the grieving process. Then, I decided to activate my international network. That is how I managed to get Alexander Borodai (a Russian rebel leader)," said Najib. He then recounted his conversation with Borodai in order to get the black box and the rest was history. Najib ended the session with a selfie with Grove as well as 450 participants at the conference.